Adrenalin boost with River Kayaking. Davao, 12 August 2009. Davao has always been known for its fruits: the pungent durian, the seedless pomelo and the exotic mangosteen. But over the years, it has gained popularity as one of the country’s top destinations for its environment-friendly attractions like Philippine Eagle Center and the Malagos Orchid Farm. Philippine eagles and orchids are understandable; they are part of Davao’s unique locale. But what about Philippine crocodiles? Sure, they are found only in the country but today, they are on the verge of extinction. In one of the episodes of National Geographic’s “Dangerous Encounters,” crocodile specialist Dr. Brady Barr said he wanted to be the first person to see all species of crocodile in the world and among those which he had seen, but found most difficult to find was the Philippine crocodile. Fortunately, he was able to see one but only about two weeks old. Kissing a baby crocodile, is it safe? As crocodiles are notoriously frightening, people often kill them. 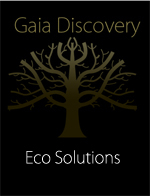 There is also very limited governmental support for any conservation measures. All these contributed to the decimation of their population. In 1992, there were estimated to be less than 1,000 in the wild. Business-wise, the skin of crocodiles are very expensive. When the skin is made into belts, the price ranges from P4,000 to P10,000. In addition, there is a big demand for crocodile meat abroad. Crocodile meat taste unusually like chicken, but only meatier. “It’s a great food,” he says. Ostrich, the largest bird in the world. As soon as you enter the park, you are greeted by colourful birds of all kinds: eagles, parrots, and lovebirds. Many are placed in cages but there are birds that are merely tied to their bird houses. If you are a bird lover, you would surely enjoy the experience. Of course, there also snakes, monkeys, and freaky lizards, too. Zipping through the lush terrain. Adjacent to Davao Butterfly House is the Ostrich Ranch. Here, visitors can interact with the biggest bird in the world. There are about 40 of them. Go through the once-in-a-lifetime experience of feeding the ostrich and capture the moment when its beak reaches your palm taking the food you are giving. If history is your thing, don’t miss the Tribu K’ Mindanawan. It is a cultural village that showcases the richness of the indigenous people through their dwellings, rituals, traditions, products and culinary arts. 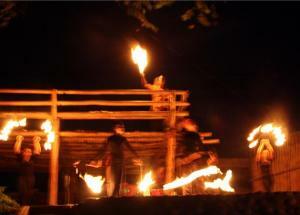 If you visit on a weekend, you will experience a cultural presentation highlighted with a very spectacular fire show. Are you concerned about not eating while there? Don’t worry; there’s the Riverwalk Grill. It is the only restaurant in the city that is situated beside the Davao River that serves crocodile dishes and many exotic foods. It is truly a unique gastronomic experience. Fiery Dance at theTribu K’ Mindanawan cultural village. Davao Crocodile Park is open every day from Monday to Sunday. It opens its gates at 8AM and its show starts in the afternoon at quarter to 5PM. It is located along the Ma-a diversion road and is only about a mere 20-minute drive from the heart of the city. Inside Davao Crocodile Park is the office of Davao Wildwater Adventure, Inc., the premier white-water rafting sports facility in the region. 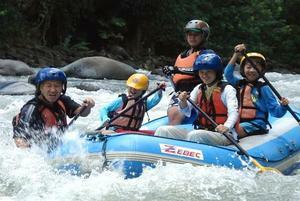 It takes tyro and experienced paddlers on a 15-kilometer adrenalin-rush ride downstream the majestic Davao River. Before doing so, they are given thorough, on-location training on land and in the river, including paddling basics. 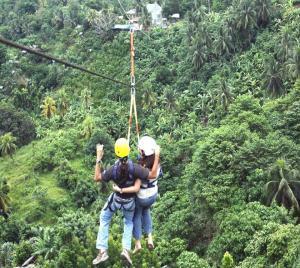 For another adrenalin-rush, there is the zip line in Zipcity, located at the Hilltop diversion road. Enjoy a 360-degree view of Davao City while zipping down the 310 meter-cable with an elevation of 120 to 200 feet from the ground. “This is just the first development because in the following months, more zip cables will be raised for a more thrilling experience,” Sonny informs. Other eco adventures Davao visitors should experience is the canopy tour, aqua fun and tarpaulin slide at Maxima in adjacent Samal Island. Maxima is a house built above the sea in barangay Cawag in Peñaplata City. It has four fully air-conditioned rooms, with all the amenities and facilities. Slide and dip in style. Maxima is the home of Abyss, the only water slide in the whole country that is made of canvass material (about 40 meters). 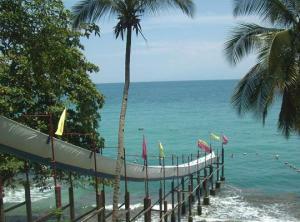 Aside from water slide, you can also do the canopy walk at the uZopper portion.